Peirce recently hosted a free “Tweeting for Career Success” workshop, where presenter Rich Levin, social media pioneer and Senior Vice President at Gregory FCA, shared how job seekers can use Twitter to create their online persona and build their personal brand. In his presentation, Rich covered the importance of representing yourself professionally on Twitter, because you never know when an employer will search for you online. He also touched on how becoming a thought leader in your industry on Twitter can connect you to the “power grid” of other thought leaders. This can help you stand out to your employer, create a massive referral network when looking for a new position, and let you rise higher and faster on the route to your dream job. If you weren’t able to attend Rich’s presentation, we wanted to share his seven tips for using Twitter for career advancement. 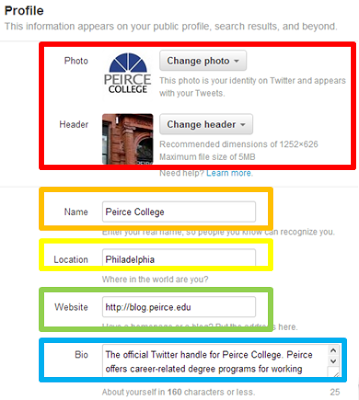 We included screenshots of Peirce’s Twitter handle throughout the post to explain these tips. 1. Prepare. The first thing you need to do when starting a Twitter handle is fill out your profile page. Remember to keep everything professional, and if you mention your employer in your profile, include a statement that says that your views do not reflect those of your place of business. The discover tab. The discover tab contains articles that Twitter thinks are relevant to your interests, as well as articles that are being tweeted by many users across the platform. See if any of the users sharing these articles are relevant for you to follow. The search bar. 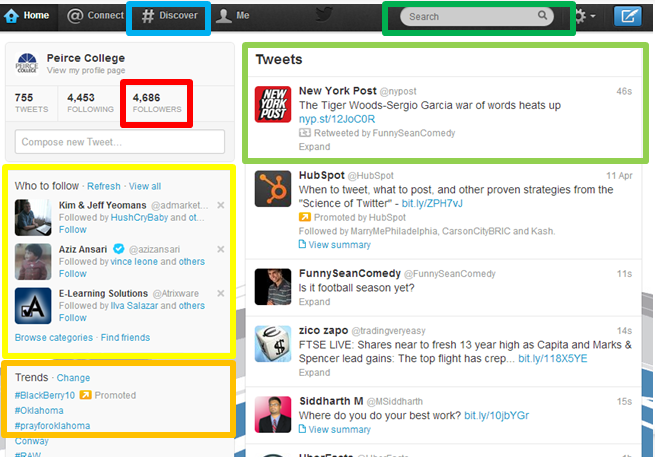 You can search for topics or Twitter users that interest you. For instance, you can search for friends, colleagues, peers, or your industry’s thought leaders. Your newsfeed. Your newsfeed consists of tweets by users you follow. You can explore their profiles, see who they follow, who follows them, and who they’ve tweeted about to find more users to follow. Who to follow. 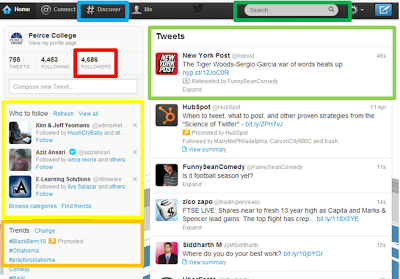 Twitter suggests users you should follow along the sidebar. The more people you follow, the better Twitter will get at recommending users who share your interests and whose tweets would be interesting to you. Trends. You might have heard the term “trending topic” on Twitter, and this is where it comes from. When many users on Twitter talk about one thing at the same time (for instance, the presidential debates or the season finale of a television show), the continual mentions make that a trending topic. You can find users who are engaging around these trending topics that interest you. 3. Follow. The adjoining step to find is follow. Once you’ve found users who share your interests, follow them. A great secret of Twitter is that for roughly every 10 people you follow, five will follow you back. So take the time every day to seek out 10 people who share your interests, share interesting content, and who you’d want to follow you. Follow them, and see how many follow you back. 4. Read. A large part of Twitter is disseminating information. You might be wondering what kind of information you can tweet that’s appropriate or meaningful – not everyone can spend all day thinking of punchy one-liners. That’s where reading comes in. Read the news and read about your industry. Find articles, blog posts, videos, images, podcasts, or memes that would be relevant to your audience. 5. Share. Every time you come across a piece of content that’s relevant to your industry, tweet it to your followers. That can be as simple as hitting the “tweet” button on a piece of news, blog post, or video, or asking a question or poll to your audience. You can also retweet information that other users have shared. For instance, Mike Schirmer, Faculty Chair of Business, here at the College recently tweeted about our Spring Reception event. The College retweeted him to share that information with the College's 4,500 Twitter followers. Try to share information a few times over the course of the day to reach as many of your Twitter followers as possible. 6. Reply. Once you've developed a large Twitter network, your followers will begin to retweet your information. You should acknowledge a retweet by replying with a simple thank you or short comment about what they posted. It shows that there's a person running the account, and helps build relationships. 7. Commune. The best part of Twitter is how it brings people together around specific topics using hashtags. Hashtags are organically created by users to categorize tweets. 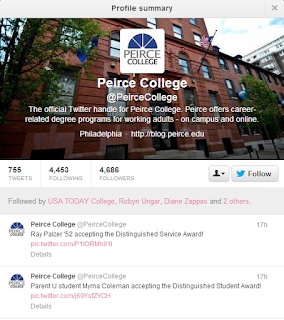 So if you're tweeting about higher education, as @PeirceCollege often does, you can include #highered or #college in the tweet to categorize it with other tweets and conversations about that subject. Research which hashtags are relevant to your industry and include them in your tweets. But remember: Use hashtags sparingly! Too many can make a tweet unreadable, and cause users to unfollow you. The most important message Rich gave was that to be successful on Twitter, you have to follow these seven steps and dedicate some time every day to building your audience. These tips won't work if you don't spend time each day cultivating new followers and sharing new information. We hope these Twitter tips help you enhance your career! Keep your eyes on the blog for a colorful cheat sheet where we'll detail these seven tips to help you keep them top of mind. If you missed the event and would like to see a similar presentation, please let us know in the comments. If we get enough demand, Rich would be more than happy to give another talk about Twitter. And if you have any questions in the meantime, feel free to leave them in a comment below.